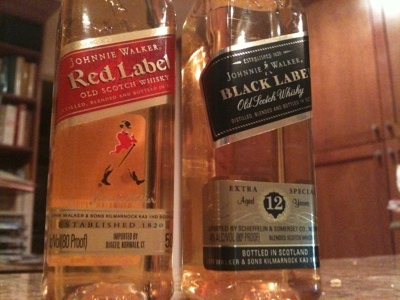 The Coopered Tot: Back to basics: Johnnie Walker Black and Red compared head to head. Back to basics: Johnnie Walker Black and Red compared head to head. Johnnie Walker blended scotches lead the world. Roughly $10-$15 separates the Red and Black expressions. Is the difference in flavor worth the money? I put up a couple of miniatures to give them a formal head to head to help calibrate my palate. Johnnie Walker Red 40% abv. Nose: Sour damp hay. Medicinal astringency. Some cottage cheese sour dairy, mixed with the smell of linens. There's also a raw beans aroma I associate with grain alcohol. Entry begins sweet but with an immediate sour note of off dairy followed by some thin cereal sweetness and a hit of spirit heat. Midpalate brings malt sweetness and some minty quality I usually associate with Irish whiskey. There is a vinyl band-aid note that is connected to the opening sourness. It's a kiss of young peated whisky. The finish is short. There's more spirit heat than I would expect at 40%. On the whole, more unpleasant than pleasant but not undrinkable. Not a whiskey experience I would repeat willingly. It mixes fine - but that's faint praise in my book. I prefer to drink scotch neat. Johnnie Walker Black 12 40% abv. Nose: the real smells of malt whiskey: toffee, vanilla, grain sugars, some floral and wood notes. Not a huge nose. Rather, it's gentle, polite, and pleasing. It smells like Scotch. Entry is sweet and creamy with malt, honey, heather, and sweet cream. Midpalate brings a gentle spirit heat but also a solid cereal grain note and a hint of peat. The transition to the finish brings in floral oak vanilla notes and a sense of the wood. The finish is moderately short, but with a real sense of wood character. I can taste the oak. It's a gentle but convincing expression of the Scottish Highland whiskey flavor profile. In my area Johnnie Walker Red is $20 a bottle and Johnnie Walker Black is $34. That's a substantial difference but the Red is no bargain. $20 also buys some decent bourbon, such as Buffalo Trace. A couple of dollars more takes you to Elijah Craig 12. There's no comparison there. There are inexpensive scotch blends that I'd prefer too, such as Arran Robert Burns, Teacher's Highland Cream, White Horse or Famous Grouse. Red simply doesn't fly, in my opinion. Johnnie Walker Black at $34 is not a bargain either, but it's a reasonable selection. Black has enough real aged malt whiskey that it really tastes like a 12 year old Highland malt whiskey. It has a gentle soothing creamy sweet character, but it also has a real wood and malt character. It plays straight over home plate - trying to approximate a mythically centered Speyside malt. The result is more polite and unobtrusive than any single malt I know - but it has the flavor profile of many 12 year old single malts. It's a solid effort and a fine pick for someone who wants a gentle utterly safe and predictable malt whiskey experience. I'm not so much of a snob that I'd look down my nose at such a choice. It has its place and JW Black fits that role just fine. That being said, I personally would prefer any of a number of other selections at that $35 price point. Among blends at this price, JW Black is strong. Douglas XO is the only comparably priced blended offering that might edge it. Competitors like Chivas 12 don't beat it. However there are strong single malt competitors at this price - but not all are a lock. For example, right now Bruichladdich Rocks is discounted at that level, as is Glenmorangie 10. Both are miles ahead of JW Black. Aberfeldy 12 and Glenlivet 12 are also at this price point (or very close), but those are less of a clear victory. I might take JW Black over Glenlivet 12, but not the Aberfeldy. Glen Garioch Founder's Reserve (the non-age statement version) is just under $38 and that's a step up from JW Black, too. Ardbeg 10 is just over $40 and it's a whole different world and then $40 is a different price bracket altogether - one that includes Macallan Fine Oak 10 - also a step up. My point here is that Johnny Walker Black plays above cheap blends and plays strong among solid blends and entry level single malts. It has a flavor profile that hits squarely in the center of what most people think of when they think of Scotch; with no flavor element significantly out of place. It's not exceptional in any particular way, but neither is it deficient. It's a clear contender, if not a striking value at its price point. It's certainly not embarrassed by the competition. Chivas Regal 12 versus Johnnie Walker Black compared head to head review.